Dog training is a specialized field that encompasses such things as teaching the family pet to follow simple basic commands and building a strong human/canine bond. 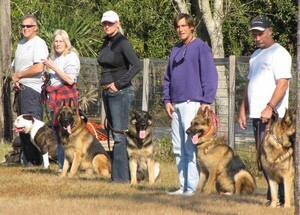 The duties associated with being a certified dog trainer can be as complex as training work dogs to recognize certain odors (like narcotic drugs) or training dogs to help the handicapped (such as seeing eye dogs), or as simple as training a dog to respect its owners and co-exist peacefully in the same home. Becoming a certified dog trainer begins with some specialized schooling followed by lots of training. Animal Behavior College is an example of a curriculum that can get you started in a dog training career. It’s a program for the serious student who is just starting out or for the professional dog trainer who is looking for formal certification. Then, in order to establish yourself as a true professional in the field, you must take additional steps to become certified. Credentials show people that you didn’t just hang out your shingle because you succeeded in getting your own dog to perform a few tricks. The Certification Council for Professional Dog Trainers is a national register of qualified dog trainers. Created in 2001, they are the first organization to begin certifying dog trainers — not only nationally, but also worldwide. Unfortunately, in some states, becoming a dog trainer simply means that you went to the print shop and had some business cards made up and managed to coerce a few neighbors to trust you to train their dog. However, if you’re serious about making this your career, then you need to approach it in a more professional manner. Apprenticing with a certified dog trainer is a good way to get you started in the field. Even working as a volunteer for a dog training facility can give you valuable experience. Not many small businesses will turn you away when you offer to work for free. It’s a great way to learn firsthand. In fact, it’s likely that as you progress and become valuable to them, you’re will eventually be offered a paid position. Once you have the basic dog training under your belt, you may want to turn your attention to a more specialized type of dog training — like police K9 training or seeing eye dog training. Becoming a professional dog trainer is a career choice that will be in high demand long into the future. If you have that special connection to animals and they seem to be at ease with you and always want to please you by following your lead, then this might be the perfect career for you! There is plenty of satisfaction when you’ve made it possible for both dog and man to work and live happily together.